People who know me, will also understand that I'm a keen learner of a place's culture, people, and it's history. Hence, when my host brought us to a drivethough Bintulu town, he asked us whether do we want to visit the Pasar Tamu, when we passed by the market. Pasar Tamu, is also known as the local prople market. This means, whatever the local has grown, or collect in the wild, can be sold here. 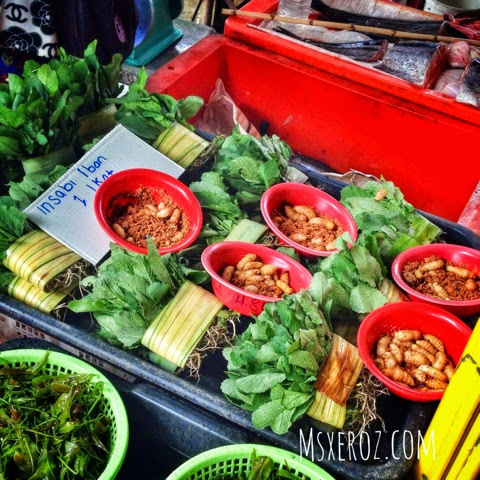 Walking in the Pasar Tamu, I was greeted by a variety of mouthwatering vegetables and fruits. Here are some of the random shots i managed to take in the Pasar Tamu. Orange pumpkins for halloween? That green coloured pumpkin are so adorable like that! 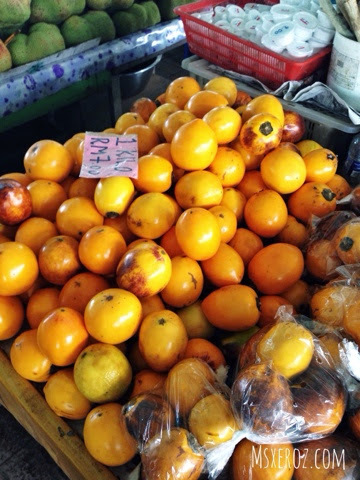 Initially I thought these are oranges or some passion fruit type of fruit. But then i was told it was the yellow brinjal, famed in the cooking of Thai Curry. I don't think in Peninsular we have such a brinjal, i've seen green round ones, but in bright orange shade like this. 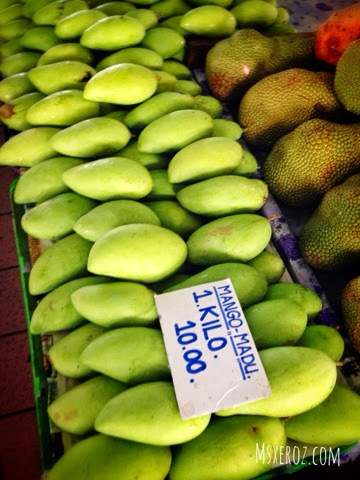 Yummy mangoes! Despite being in a small town, the fruits and other items being sold here are all labelled neatly. I'm impressed! I was also told that Bintulu is famous for it's Belacan and Ikan Masin. 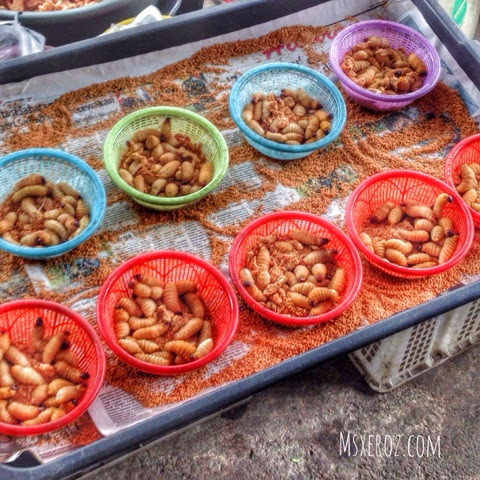 Belacan is some sort of dried shrimp paste, filled with nauseaus odour. But once fried with chilli paste and onions, it gives a whole new dimension of taste to a food that is dipped with it. 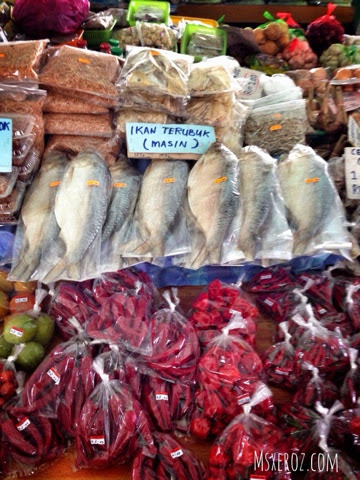 Ikan Masin, on the other hand, is salted fish. Salted fish can be used while steaming together with meat or just fried it and eat with plain rice. Fresh bird's eye chillis, dried chillis, big chillis and small chillis are abundant here. I wonder how are they going to sell all those chillis! 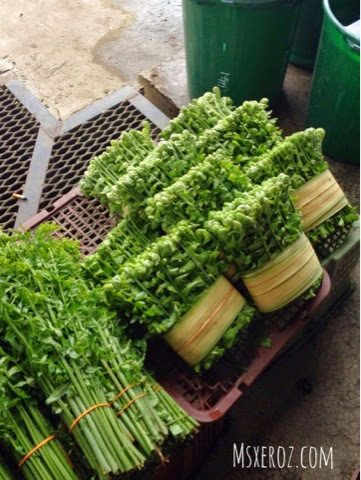 A local wild fern, also known as Sayur Midin. 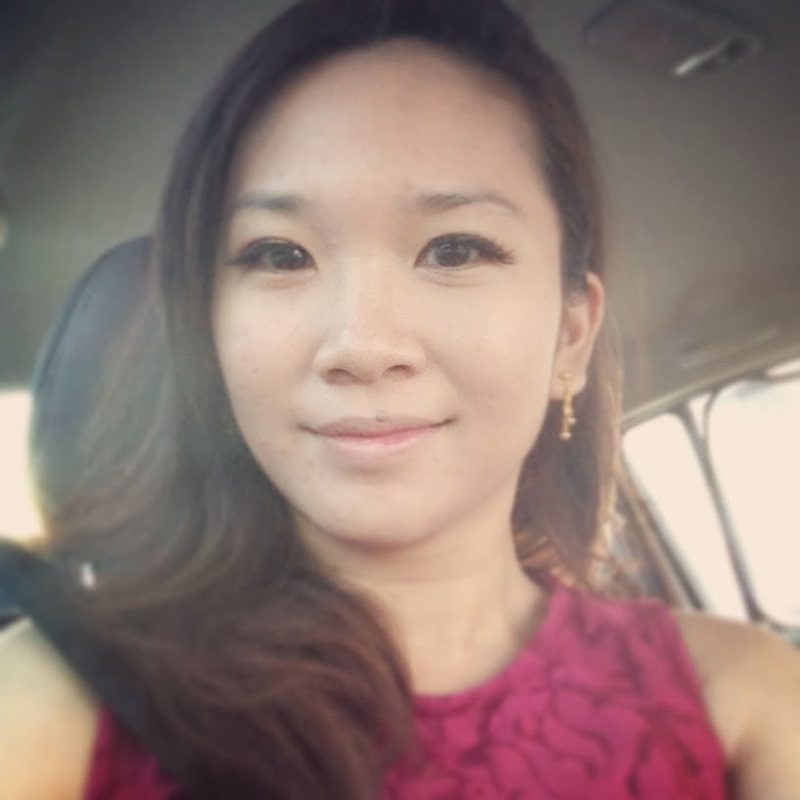 According to my friend, Midin cannot be planted, as it grows via spores. Hence, the local will have to search for Midin and bundle up like this to be sold. Also Midin plant oxidises very quickly, hence, it cannot be kept for a long time, as it will turn black. Midin vege has become my new favourite. I love the crispiness of the vege, and it has a subtle sweetness like french beans. Then, this black hardshelled fruit caught my eye. I swore i almost leaped in joy at the sight of it. 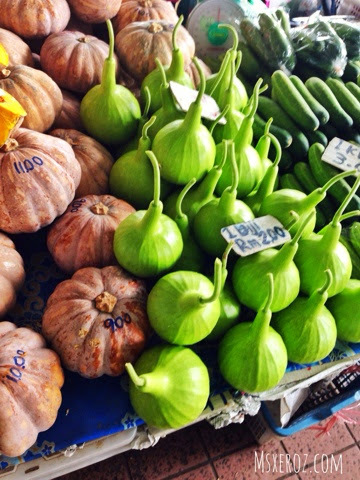 In Vietnam, I was introduced to this fruit named "Trai say". It has velvety flesh, sourish taste, which i am addicted to. 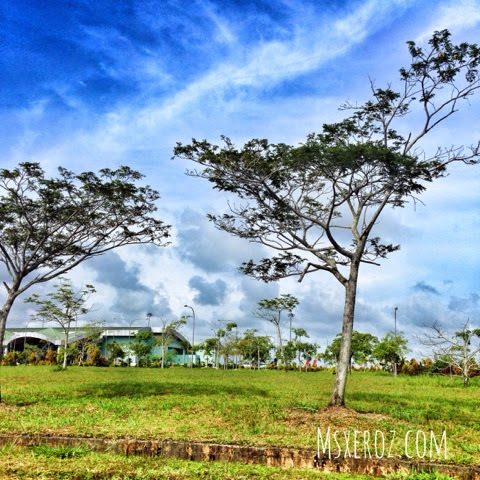 Then i found "Trai Say" in Bintulu! 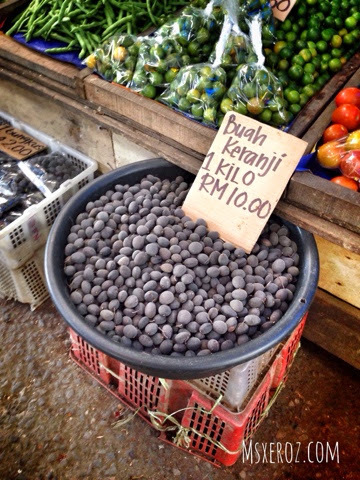 So, the local name for this queer fruit is Buah Keranji! Back to Pasar Tamu exploration, the first thing that shock me was a neatly-dissected Monitor Lizard being sold. Monitor Lizards or locally known as biawak, is abundant in soils of Malaysia, especially in the rainforests area. It is more commonly used as a meat replacement in curry dish. In peninsular, i have tasted once (in my lifetime) biawak curry. Tasted like fish-chicken. The meat is more tasty than of wild boars. Besides worms, snakes are also sold. Wtf! But these snakes are all enclosed in the guni bags, so i never really made an eye contact with the snake. I was also told that birds and tortoises can be found in this market too! I'm quite free today, maybe gonna blog all of it to clear up my iPhone space. All photos are captured and enhanced using only iPhone 5.